How to order new SIMs? As part of the product reference, select in the drop down the product you want to order. For ease of use, the selection is limited to the products that have been qualified for your account. Provide the quantity that you need. Be aware that if you choose a quantity lower than the Minimum Order Quantity, the order may be rejected or administrative fees may apply. Select a delivery address. By default, you can deliver the SIM cards to the Billing Contact provided as part of the contract. 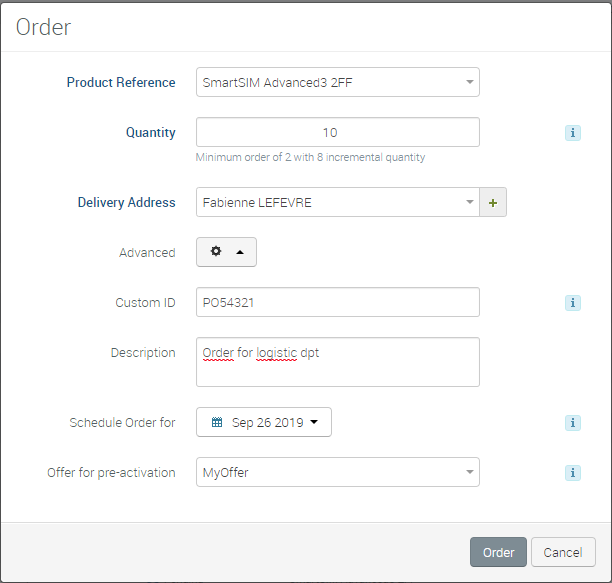 If you want to add a new delivery contact, you do this easily by clicking on the (+) field at the right of the drop down, or by navigating to Administration > Delivery contact menu. Description: which is visible from your users only (not transmitted as part of the order) and can be used for any internal notes about the order. Schedule order for: which can permit to schedule your order in the future and therefore plan your next orders. To be noted that the date provided is an order date, not an expected delivery date. If you want to receive your order before a given date, you need to allow sufficient time for the order to be treated and shipped. Once you are ready, click on Order.